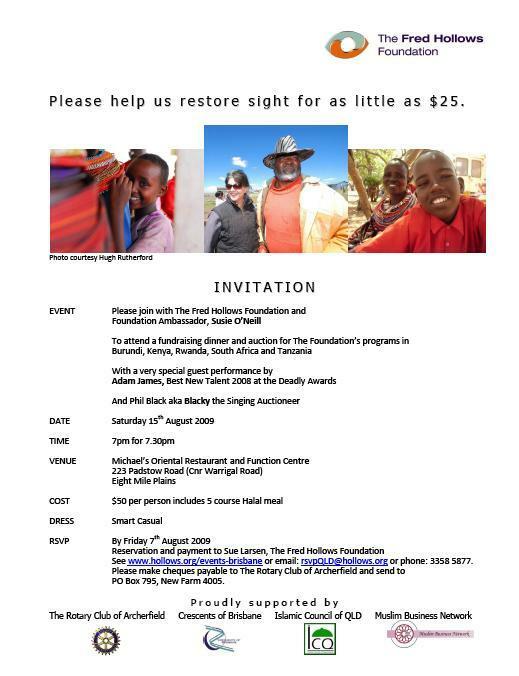 Using his impressive contacts with the (then) federal government Abdul Rahman (Ray) Deen, now in his 20th year as member of the Rotary Club of Archerfield, obtained funding for the Fred Hollows' Pakistan � Australia Sub-Specialty Eye Care Project (PASEC) to the tune of $5.23 million over five years. 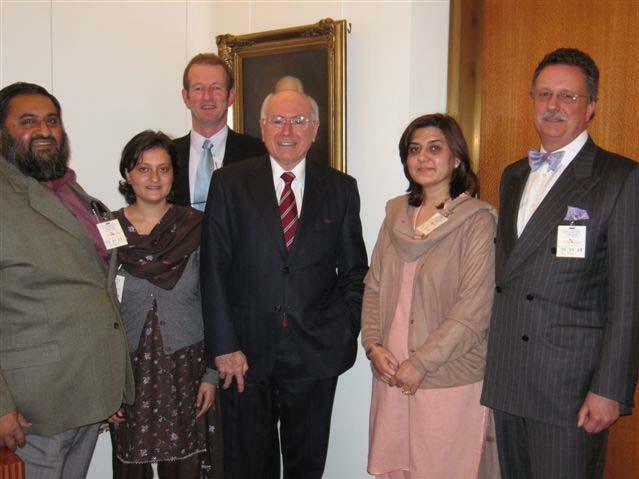 Through former MP Gary Hardgrave Mr. Deen facilitated the meeting with the then Prime Minister John Howard and representatives of The Fred Hollows Foundation on 6 September 2006. As a result of this meeting a proposal for funding the Pakistan program was submitted to AusAID. The PASEC project will focus on provision of services for childhood blindness and diabetes related eye diseases. Once these services are up and running it is estimated that over half a million children will access them each year and have their sight fully restored. Similarly, the project will enable the public health sector of Pakistan to tackle eye diseases due to the emerging problem of diabetes in the population. I would like to make you aware of the amazing results achieved by Abdul Rahman Deen�s involvement on behalf of our club and the Fred Hollows Foundation. To mark our 25th Anniversary, PDG Dave Mayo, who was District Governor at our Charter Meeting, presented our club with a Perpetual Trophy for Outstanding Achievement, and presented it to the inaugural winner PP Ray Deen. The trophy was made from an old cinema hall in Wynnum, painstakingly restored and polished to its natural beauty, with the perpetual plaques attached. All the members of the Rotary Club of Archerfield and myself never cease to be amazed with the enthusiasm, time, commitment and results that are achieved by Past President Rahman Deen. We have formally recognised his efforts by presenting Ray with a Paul Harris Fellow for his outstanding contribution. 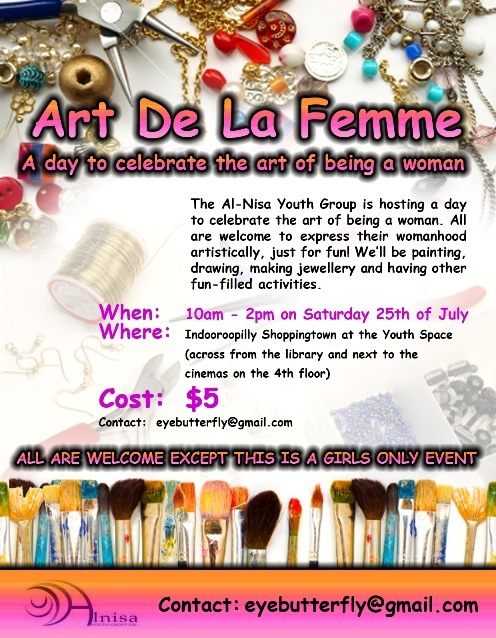 In conjunction with Fred Hollows Foundation Qld. and the national body via Sue Larsen (Hon. 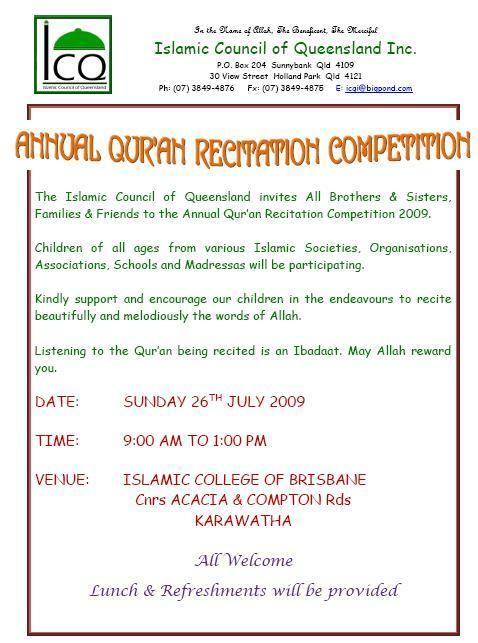 Rotarian) and with further support from the Islamic Council Queensland. 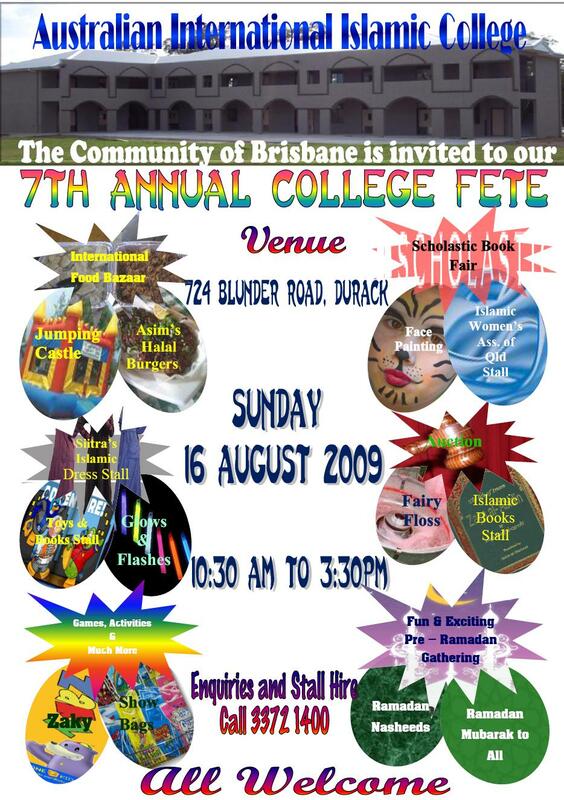 Inc., Crescents of Brisbane Inc., the Muslim Business Network and Rotary Club of Archerfield, a major fundraising programme is about to start in mid August 2009. Reconstructing Jihad amid Competing International Norms by Dr Halim Rane was launched at Griffith University in Brisbane on 13 July. The book, which has already been internationally praised as a groundbreaking study of jihad, conflict resolution and Islamic law, was officially launched by the world-renowned professor of Islamic law, Mohammad Hashim Kamali. Experts in the field, such as Professor John Esposito, Director of the Al Waleed Centre for Muslim-Christian Understanding at Georgetown University in the United States write that �few topics are as important and contested as that of violence and non-violence in Islam and especially that of jihad, its meaning and usages. Despite the importance of this topic in Islam and in Muslim politics today, very few scholars bring the nuances in their analysis and critique that are evident in this study. Prof Esposito adds that �Dr Rane's analysis of jihad in Islamic religious thought and history is especially impressive, providing a masterful presentation of the history and usage of the term jihad�. Other impressive aspects of the book are its comprehensive analysis of all of the United Nations Security Council Resolutions on the Israel-Palestine conflict, examination of the Israeli self-defence claims versus the Palestinian right of self-determination, and its contribution to the understanding and application of the Quranic verses on war and peace. In the context of international norms and identity factors Dr Rane�s book presents a contemporary methodology for the reconstruction of jihad from a doctrine based on the use of armed force to one that gives �Islamic� legitimacy to non-violent resistance. Using the Israel-Palestine conflict as a case study, the book explores the impact of competing international norms in the process of conflict resolution. Combining a constructivist perspective of international relations with contextualist and objective-oriented (maqasid) approaches of Islamic studies, Dr Rane examines the conditions under which a just resolution of the Israel-Palestine conflict is possible. Based on extensive research and statistics, he demonstrates why Palestinian nonviolence would be more conducive to their liberation struggle than violent resistance and how this is a legitimate and authentic form of jihad consistent with the higher objectives of Islam. Reconstructing Jihad amid Competing International Norms is based on Dr Rane�s acclaimed PhD thesis which was awarded the prestigious Chancellor�s Medal for Excellence in the Doctor of Philosophy. 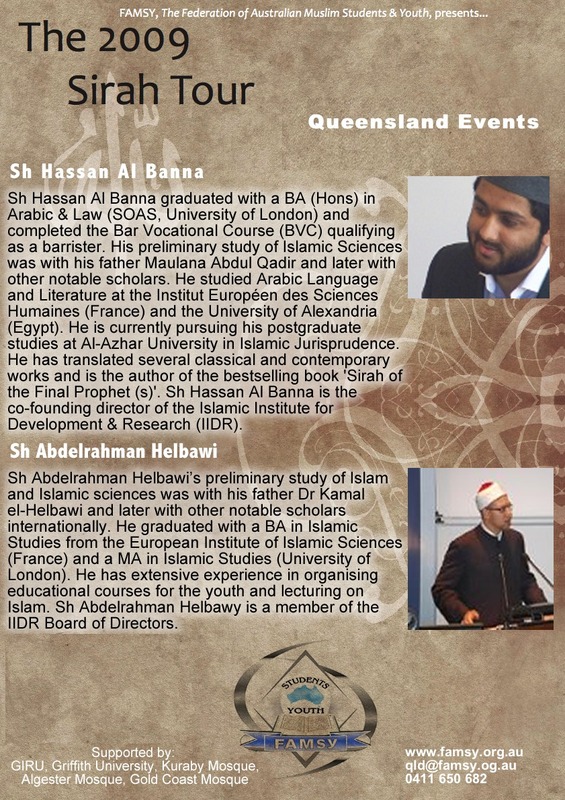 Dr Halim Rane is the Deputy Director of the Griffith Islamic Research Unit and a Lecturer in the National Centre of Excellence in Islamic Studies at Griffith University. 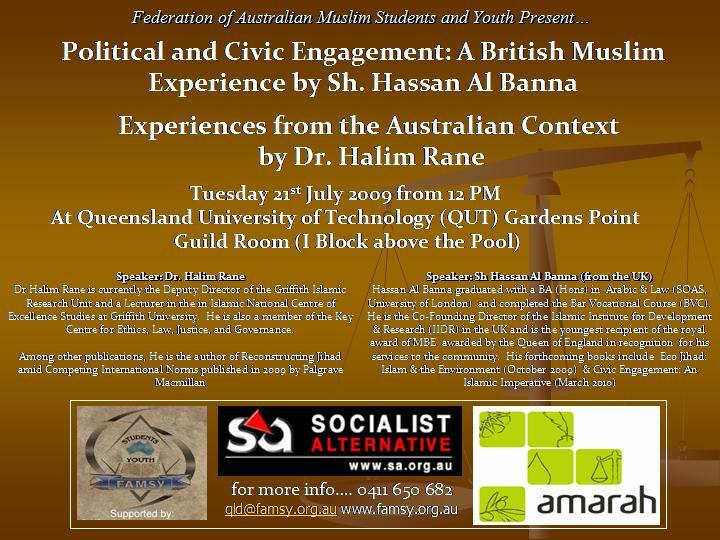 Further details about Dr Rane and his research can be found on his official website www.halimrane.com. 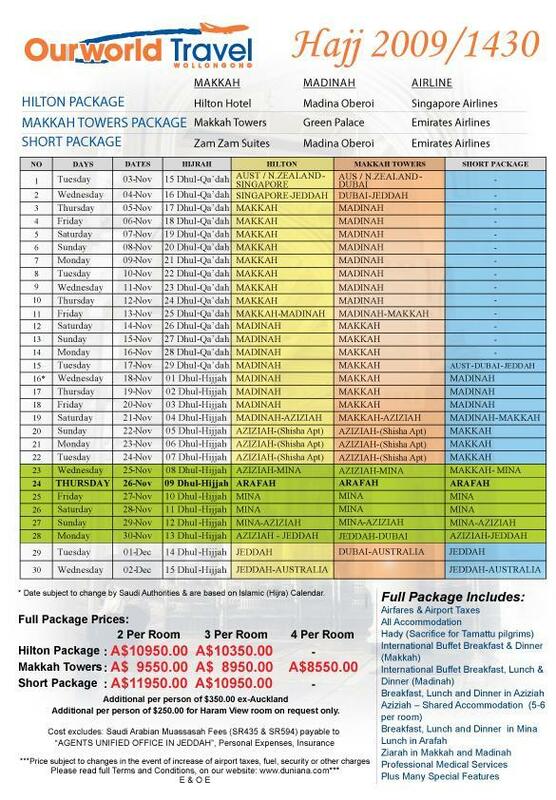 The Federation of Australian Muslim Students & Youth(FAMSY) proudly presents The 27th Annual FAMSY Conference; �The Sirah Tour�. 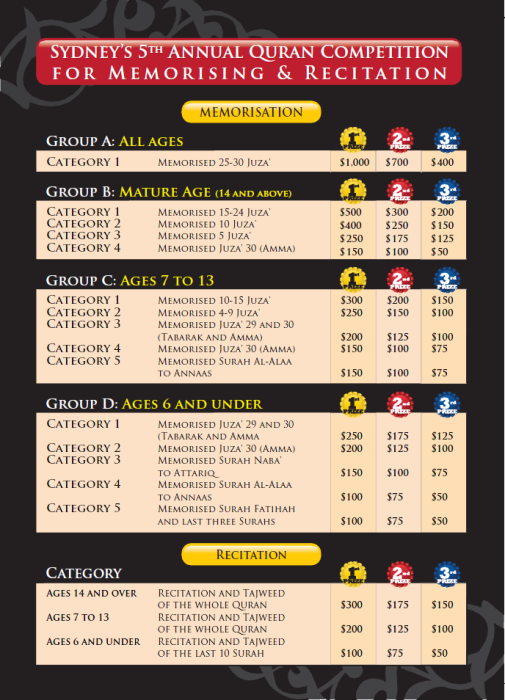 The Sirah Tour is the central theme for this year�s conference, and it will also be the subject delivered to a variety of other tour cities. As well as Melbourne, The Sirah Tour will visit; Auckland (New Zealand), Brisbane, Canberra, and Sydney. The 2009 Sirah Tour will attempt to celebrate and communicate the life and message of the final Prophet, Muhammad. 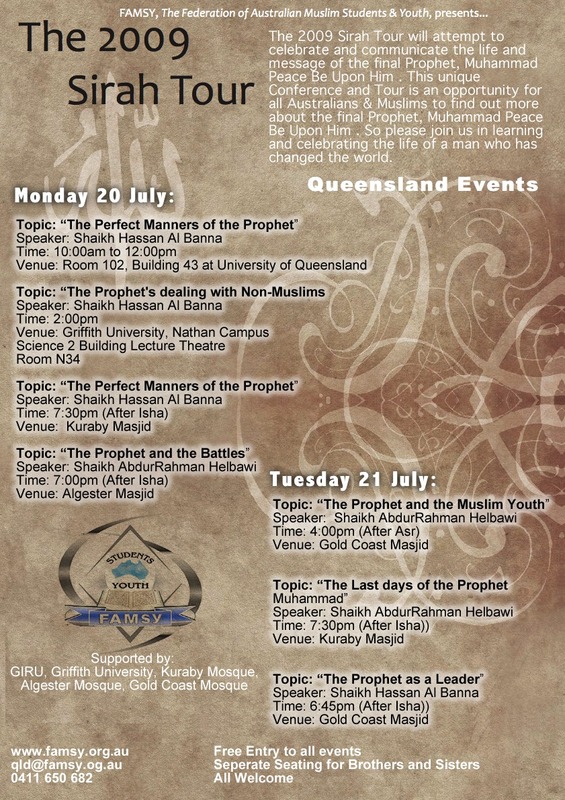 Never before has an event like this graced the shores of Australia, and as such a number of international and local speakers will attempt to convey the important and valuable messages from the life of the final Prophet. 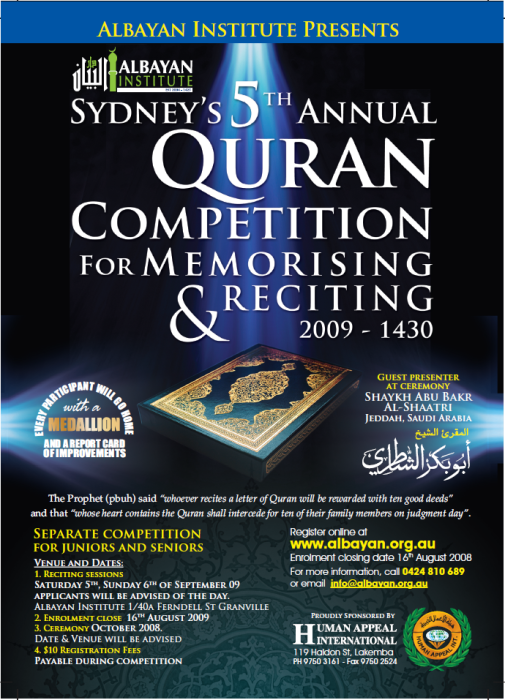 This unique Conference and Tour is an opportunity for all Australians & Muslims to find out more about the final Prophet, Muhammad. So please join us in learning and celebrating the life of a man who has changed the world. The newly established Islamic School on the Gold Coast will be allowed to keep its doors open longer but has been refused extra concessions by the Gold Coast City Council. The Carrara school, was granted approval in February but sought to alter eight conditions imposed by the council. Mayor Ron Clarke has signed off on three changes despite a groundswell of opposition against the city's first Islamic school. More than 1174 submissions were made against the application. City planning boss Cr Ted Shepherd said the school would now be allowed to keep its doors open from 7am to 6pm and to operate a public address system during the day. "We've looked at the application and we feel that this is the best outcome," said Cr Shepherd. "This is the same as other schools in the city offer." He said the council would also allow a relaxation on a condition to enforce the construction of a toilet block until when the school roll exceeded 46. 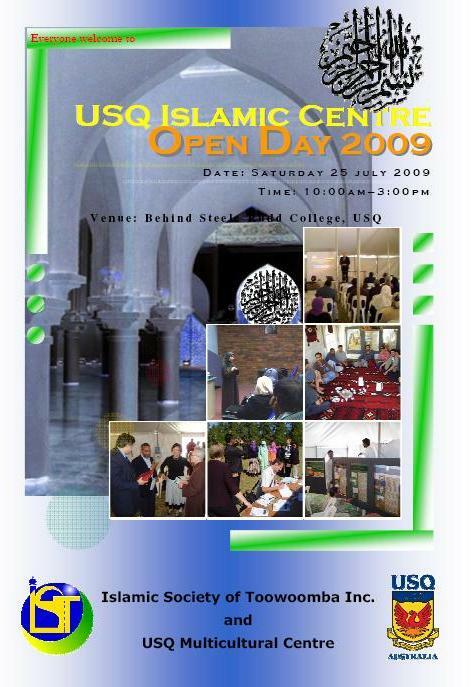 School trustee Keysar Trad had criticised the council's handling of the application, which is backed by the Australian International Islamic College. How sure are you that you are praying in the right direction towards the Qiblah? 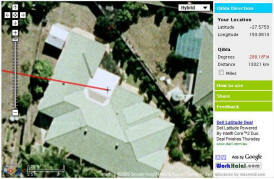 Check out the Qibla Locator. Enter your location or street address, select map, hybrid or any one of the other options and point your mussallah (prayer mat) in the direction of the red line. 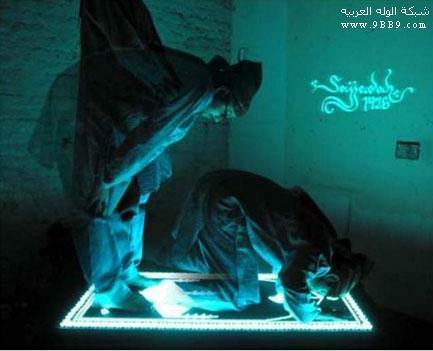 Then again, you can always get hold of a prayer carpet designed in Turkey that will glow when the mat is pointing perfectly in the direction of the Qibla. 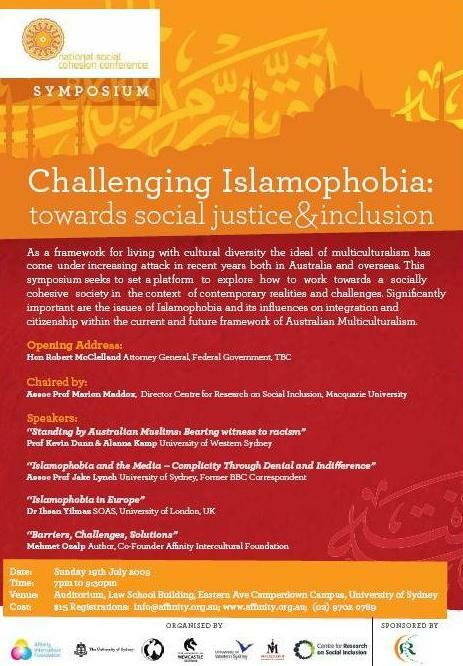 Şehnaz Tahir-G�r�ağlar, Associate Professor of Translation Studies at the Bogazici University, Istanbul, in Turkey was attending the Conference of the International Association for Translation and Intercultural Studies In Melbourne when she was interviewed on ABC Radio National on the subject of the Azan in Turkey. For a period of 18 years, between 1932 and 1950, the Islamic call to prayer - the azan - called five times daily, was compulsorily delivered in the Turkish language, rather than in Arabic. A combined GIRU and MBN dinner/lecture function was held at the Runcorn Function Room on Wednesday attended by some 100 participants. Dr. Mohamad Abdalla of GIRU described the development of his Islamic Research Unit and the tremendous strides taken over a short period to establish the unit as a centre of excellence in Islamic education both nationally and internationally. This week's business news can be downloaded here. With the sharemarket also showing life, MBN has also compiled a market wrap that provides summary information about the largest companies in Australia by market capitalization. The staff of the Muslim Welfare shop in Woodridge continue to focus on the welfare of people who have approached them for various reasons in the past few weeks. 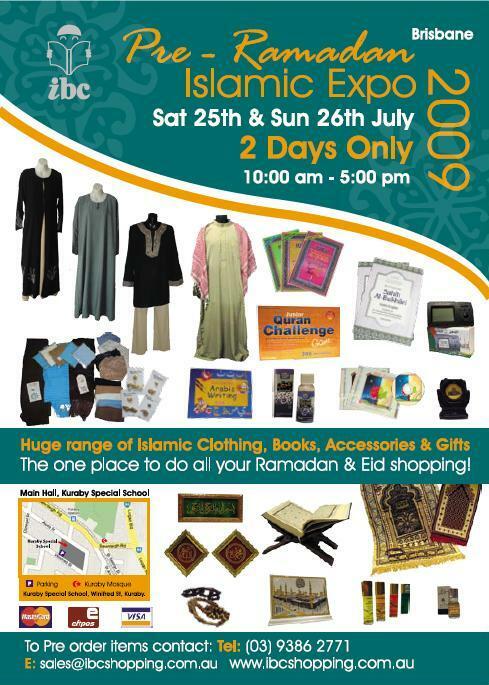 They have helped three different needy families set up home with merchandise and household goods since opening the shop, all with goods donated by the Muslim community. A Muslim brother from Pakistan came out on a 457 visa to work as a mechanic on a four year contract. He worked for two years and then had enough money to bring his wife and family out here in January. In February, the company he worked for, closed its Rocklea office and left the workers without jobs. He was one of the workers, and the only one from overseas. He has managed to survive on the small savings he accumulated after bringing the family from Pakistan. He had been trying to find a new sponsor failing which he will have to return to Pakistan by 31 July. This man has a very impressive resume and references. He has been trained in mechanics through the Pakistan Air Force and can work on diesel and petrol engines. He can build and service bus, car and truck engines. He is also a qualified fitter and turner and has done six months of a carpentry course. He is willing to go anywhere in Australia for work. The family love the country and would be entitled to stay if he can only find a sponsor before the end of July. If you have any suggestions as to how this family can be helped please call contact the Welfare Shop on 0435 086 796. 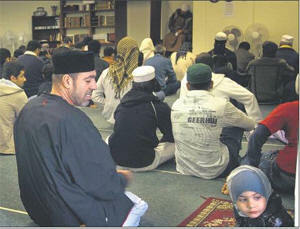 Western Australia: A Muslim group ordered to stop holding big prayer meetings at a Cannington industrial unit says it is not causing problems and numbers have ballooned because the group�s religion says people cannot be turned away. The State Administrative Tribunal rejected the Daawah Association of WA�s application for a review of a Canning City Council decision not to allow bigger Friday prayer services, known as Jumu�ah salah. The city granted the association approval for �community purpose and educational establishment� in 2001 on the condition there were no more than 20 people there at any time. However, Daawah Association secretary Tariq Anzar said alternative established prayer sites were full and there was a big local demand for the weekly service. Mr Tariq said the association would reduce its numbers as required by August 25 but moving the important session would be a logistical headache with no site guaranteed each week. �As far as Daawah is concerned, we don�t want trouble,� he said. �We don�t want to hurt anyone, we don�t want to disturb anyone, we don�t want anyone to be affected with the parking issue at all.� The tribunal this week found there was not enough parking at the Kent Street unit and �public worship� was prohibited in a light industry zone. The decision was criticised by ethnic groups. Mr Anzar said the association wanted to build a centre in Queens Park but the council rejected its first design because of a lack of parking. Canning mayor Joe Delle Donne has said the city was working with the association to find an alternative. The Sunnybank State High School would be grateful for any assistance any CCN readers and the Muslim business community can give by way of work experience placements for their year 10 students. Work experience is part of Certificate I in Work Education run at Sunnybank and in order to complete the certificate students must complete one week of work experience. During that week a teacher will visit the students and leave with the business owner a report to be completed and faxed back to them at school. The dates for work experience this year are 31 August 2009 - 4 September 2009. As these dates fall during the Ramadan period and there are many Muslim students who need placements, it is hoped that Muslim businesses sensitive to the needs of these students over this period, in particular, could well assist here. This research will examine what kind of language governments use in relation to terrorism and violent extremism, and the effect this language has on various individuals and community groups. If you think the current way of talking about these issues are inappropriate or bad for Muslims this is your chance to have a say and be heard by the government. 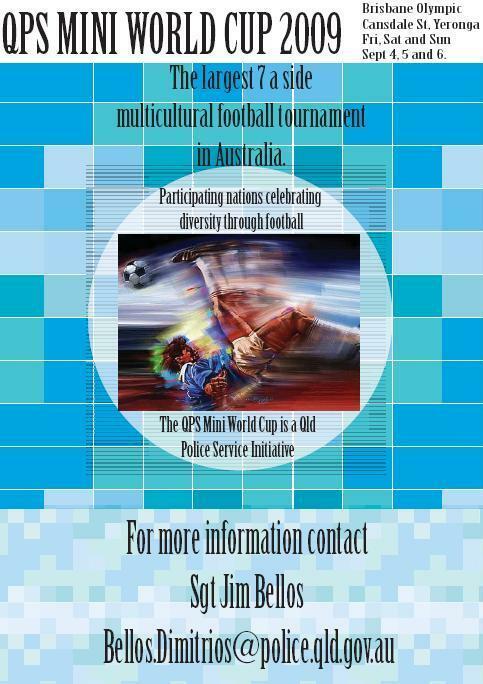 This research is being conducted Australia-wide by the Australia Multicultural Foundation in conjunction with several government departments. AN ALP-dominated western Sydney council has lobbied the NSW Government to prevent an Islamic school opening in its area, despite Land and Environment Court approval for the development. Soon after the court dismissed Bankstown Council's appeal against the school, the council wrote to the Minister for Education, Verity Firth, asking that the Government acquire the Bass Hill site, either by agreement or compulsorily. This week Ms Firth ordered the Education Department to negotiate to buy the site but denied the council's letter played a part in her decision. The land was now needed for a school for disabled children, she said. Al Amanah College's plans for a 1200-pupil school had been bitterly opposed by the council and residents. Objections were raised on traffic, noise and design grounds, but there were allegations some opposition was racially based. The council rejected development applications twice, but twice the Land and Environment Court found in the school's favour. The first time, in December, Senior Commissioner John Roseth asked "whether the council would have raised quite as many contentions as it did if the application had been for an Anglican school". After the second judgment, in May, Al Amanah started preparing to begin building on the site next to Bass High School. Instead, it is now preparing to battle the Government. Ms Firth said in a statement that demand for a special needs facility had been increasing since 2005. But in 2006 the department deemed the site surplus to its needs and sold it to Al Amanah for $4.4 million. Ms Firth rejected suggestions that her real purpose was to stop the Islamic school. "This decision was made following advice from the Department of Education and Training that a special school was required in the area and that this was the most appropriate site. It is unrelated to the building of an Islamic school on the site," her spokeswoman said. If the owners refuse to sell, Ms Firth is prepared to use compulsory- acquisition-of-lands legislation. The president of the Australian Federation of Islamic Councils, Ikebal Patel, said the Government's plan was preposterous. "To know that there is a school that has gone through two lots of hurdles to now want to exercise compulsory land powers - it's very disappointing." 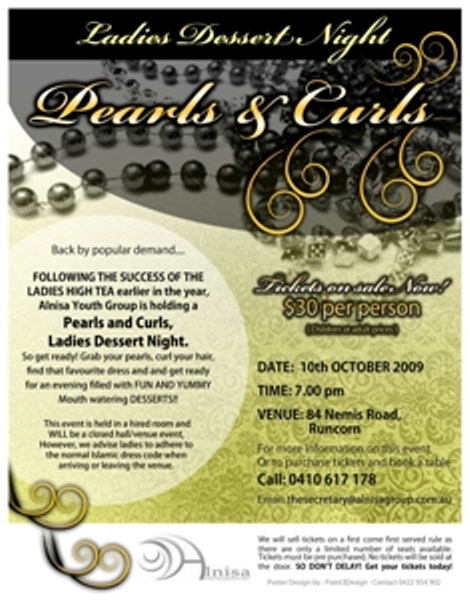 FOLLOWING THE SUCCESS OF THE LADIES HIGH TEA earlier in the year, Alnisa Youth Group is holding a Pearls and Curls, Ladies Dessert Night. So get ready! Grab your pearls, curl your hair, find that favourite dress and get ready for an evening filled with FUN AND YUMMY Mouth watering DESSERTS!! Bosthan's Restaurant and Take Away has a new addition to their kitchen. The Chef of Saiheba Restaurant, Mustafa Asghary, has brought with him his mouth watering recipes. 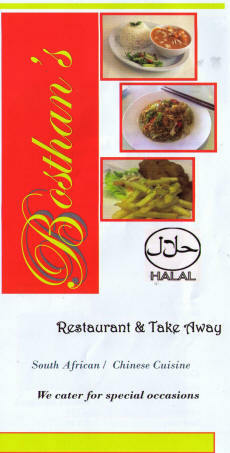 So why not give Bosthan's a go - there are over 200 menu items to choose from covering the best in Indian, Chinese and South African. I look forward to reading the CCN newsletter every week for updates on events, interesting articles and other general material. 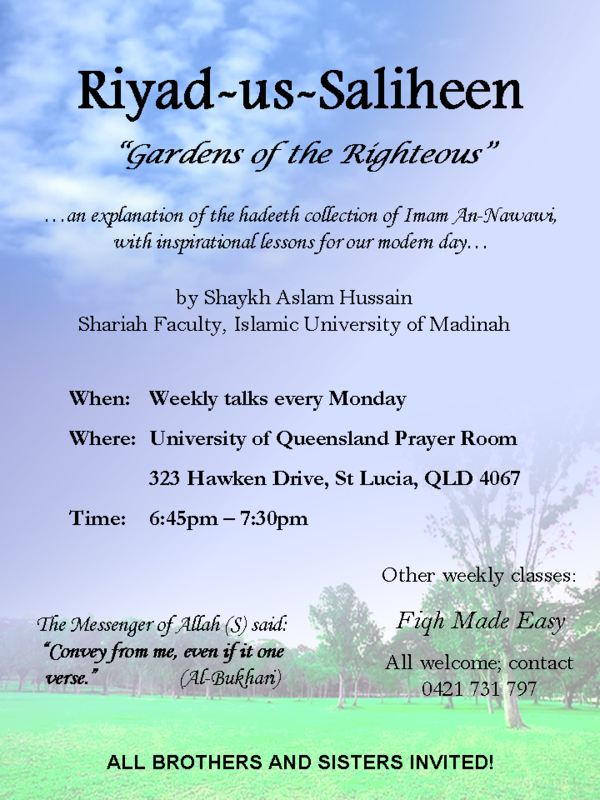 However, while I was reading the article on the "Sounds of Lights" I was really disappointed that you did not mention the student choir from the Islamic School of Brisbane. The students and their parents have dedicated a lot of time towards rehearsing the national anthem for this event, including time over their school holiday's. I'm certain these young students would have appreciated some acknowledgment for all their hard work as they were enthusiastic and very motivated to be part of the event. I'm not sure if you have received any feedback but it would of been a nice gesture to have at least mentioned them or have a photo in the newsletter. [Editor] CCN acknowledges this gross omission and trusts that Kishwar's eloquent email redresses the situation to some extent. I am constantly amazed by the range of topics you are able to put in CCN weekly. 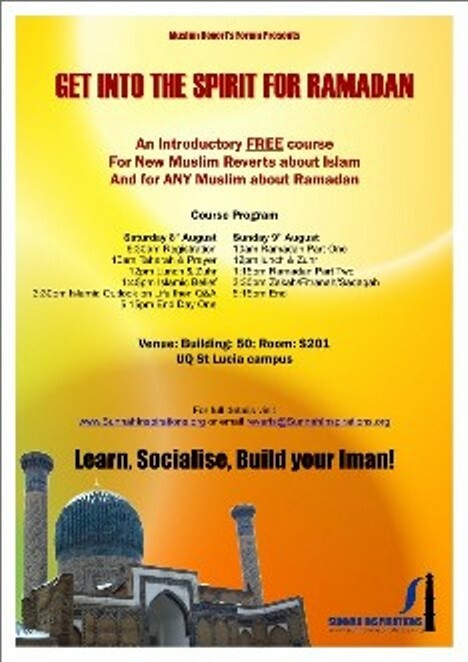 Keep up the good work, this really creates harmony as non-Muslims like Muslims learn more about others. SYDNEY/KUALA LUMPUR � Australia's top investment bank Macquarie met bond investors in Malaysia last week, two sources familiar with the meetings said on Monday, with one saying it may consider a potential bond sale there and perhaps even an Islamic issue. Both sources declined to be named because they are not authorised to speak to the press. UK: A conman who tricked religious pilgrims out of hundreds of thousands of pounds has been jailed for six years. Mohammed Faruk Ahmed pleaded guilty to using money meant for the Muslim pilgrimage to Mecca and spending some of it in casinos and betting shops. Police say Ahmed conned at least 300 people in London's East End, many of whom devoted their life savings to the 2008 Hajj pilgrimage. The Metropolitan Police is recovering some cash from accounts in Bangladesh. "Ahmed shamelessly defrauded hundreds of innocent victims who had planned the most significant trip of their lives"
Ahmed, of Brick Lane in London, was running a travel agency called Qibla Hajj Kafela Services. He was offering to organise trips to the annual pilgrimage in Saudi Arabia - but was in fact preying on the local Bangladeshi community and Muslims in other parts of the country. The 41-year-old took payments of almost �2,000 per client, amassing �570,000 from 300 victims. Instead of using the cash to secure visas, flights and hotels in Mecca, Ahmed went on a gambling spree in casinos and bookmakers - and then fled abroad. Meanwhile concerned pilgrims began calling the Metropolitan Police asking for help. They had received no travel documents and the deadline to obtain Hajj visas from the Saudi embassy was fast approaching. Officers raided Ahmed's premises and discovered the 300 passports and paperwork showing �250,000 had been secretly moved from his business account to Bangladesh. Detective Inspector Des McHugh of the Metropolitan Police told the BBC his team worked around the clock to ensure as many passports as possible were returned to victims so they could still submit them to the Saudi embassy for a pilgrimage visa. "Ahmed shamelessly defrauded hundreds of innocent victims who had planned the most significant trip of their lives," said Det Insp McHugh. "We worked hard to investigated the full scale of Ahmed's crime and officers placed themselves under additional pressure to process evidence and return passports to victims as soon as possible," he said. Detectives eventually arrested Ahmed when he returned to the UK. The �250,000 moved to Bangladesh had been frozen by court order, pending Ahmed's jailing. Officers are now finalising steps to return the cash to the UK so victims can make recovery claims. "In many cases victims lost their entire life savings but still managed to retain their dignity and supply significant evidence to our investigation team," said Det Insp McHugh. "Thanks to them and to a thorough police investigation Ahmed had no choice but to plead guilty," he said. Make sure your daily intake of vitamins and minerals are met. Remember your five serves of vegies and two serves of fruit per day! Stay hydrated throughout the day as this helps you feeling energised as well. Aim to get at least seven or eight hours of sleep each night. A good night's sleep will make any day seem more manageable! Being active allows you 'time out' of your busy schedule and enhances your blood flow - helping to improve the passage of nutrients through your system. enjoy that will get your heart pumping!!! The idea is to get rid of that winter-weather blues....so let's get active - HAVE FUN!! 1 kg chicken mince; 1 tsp salt; 1tsp Ground green chillies; � tsp ground jeeru/cumin seeds; 1 slice bread soaked in water, 1 large onion finely chopped; 1 bunch fresh dhunia (coriander leaves) cleaned and chopped. A pinch of tumeric powder. Add all ingredients and knead well. 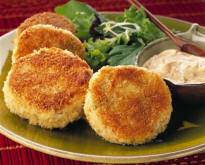 Make into cutlets place in greased oven tray. Grill at 220 until slightly brown. Then dip in egg and Southern fried hot coating. Thereafter fry till golden brown. A young man was hired by Mula Nasruddin to work in his shop and he reported for his first day of work. Mula Nasruddin greeted him with a warm handshake and a smile, then gave him a broom and said, "Son, your first job will be to sweep out the store." "But I'm a graduate of the top Islamic University in the country," the young man replied indignantly. "Oh, I'm sorry. I didn't realise that," said Mula Nasruddin. "Here, give me the broom -- I'll show you how." 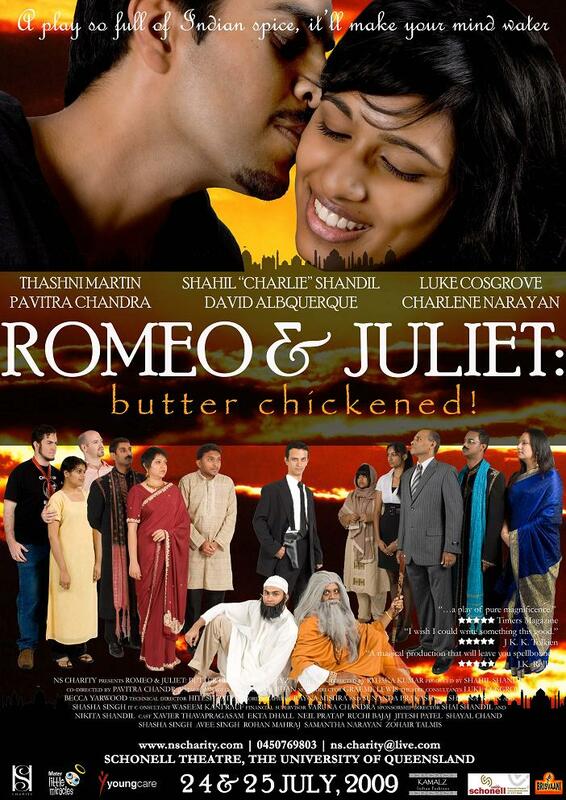 Romeo & Juliet: butter chickened!